In this tapestry 'Vouzon', we see a scene inspired by the countryside in this central region of France which was a province formed in the French Revolution in 1790. 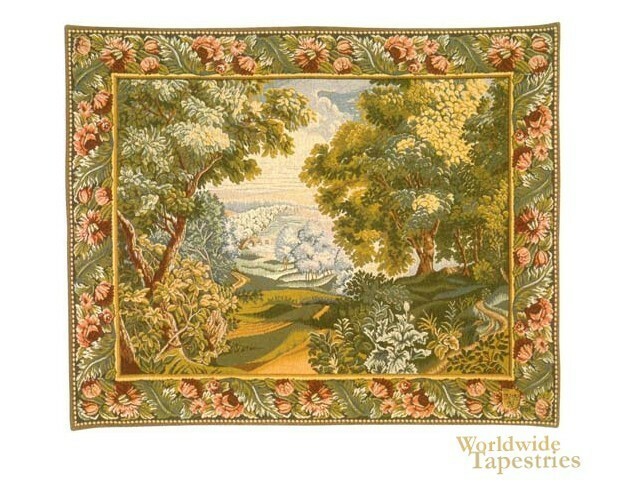 This work is a verdure tapestry which is a much loved type of tapestry since the 18th century. A verdure such as this portrays a scene from nature, usually of the countryside with or without rivers and cottages. In this tapestry 'Vouzon' we see a pure countryside scene with a foreground of leaves and plants, and midground of trees and detailed bark and foliage, and a softer and blue hued distant hills and forest. The scene is reminiscent of an idealised landscape with elements to interest the eye and imagination throughout the piece. This tapestry is backed with lining and has a tunnel for easy hanging.